Astonishingly it is true, I have done all these things. Can you believe it? Long ago I was traumatised, at the height of my teenage vegetarianism, when my French exchange hosts attempted to take me fishing. Treating the whole thing as if it were a bit of harmless fun, rather than the callous blood sport that I knew it to be. And there was a poor fish, wriggling on the end of a hook and gasping for his life, with a whole family of chuckling Frenchies loving it and looking at me expectantly. And me, attempting to convey in pre-GCSE French, that I really didn’t want any part of it. But that was then. I am harder now. 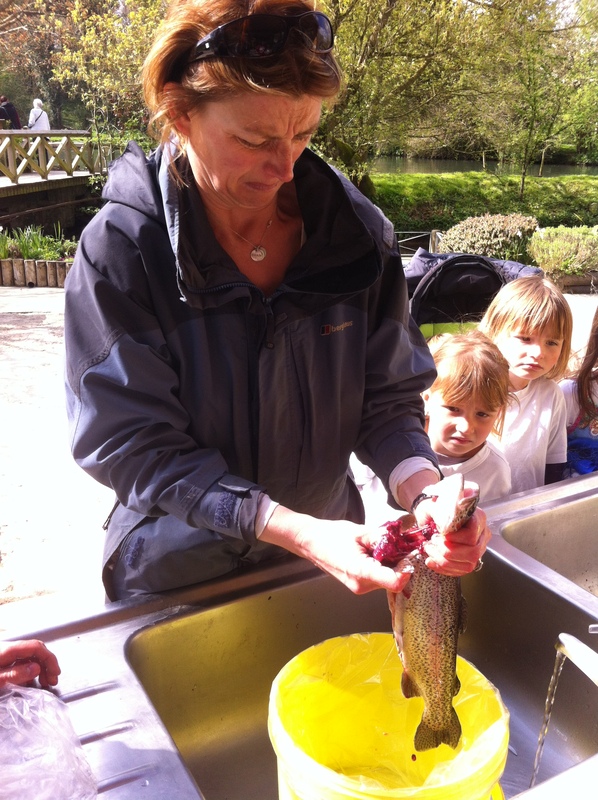 This time there was me, at Bibury Trout Farm, catching the unsuspecting trout, trapping it in a net, and bludgeoning it to death with a rounded stick, in front of 7 children, for no reason other than that I had set myself a challenge to do some unpleasant things for 3 months. Interestingly, the kids were more interested than distressed. They looked on agog as I caught it and lifted it from the water. And stared harder as it wriggled in the net. Caitlin the 5 year old photographer forgot her camera duty as I began beating it to death, she was too horrified to focus. Another friend took over on the pictures front. Then came the washing it and gutting it. I cut its throat, removed its head, ripped out the innards, and washed it inside and out. It was altogether a happier prospect once its eyes were no longer on me. The children were all fascinated. ‘Is that real blood Mummy?’ ‘Is it dead Mummy?’ And then ‘What is that brown stuff?’ ‘Is it really poo?! In real life! Mummy are you washing fish poo?? ?’ And yes, indeed Mummy was. How that cheered everyone up! 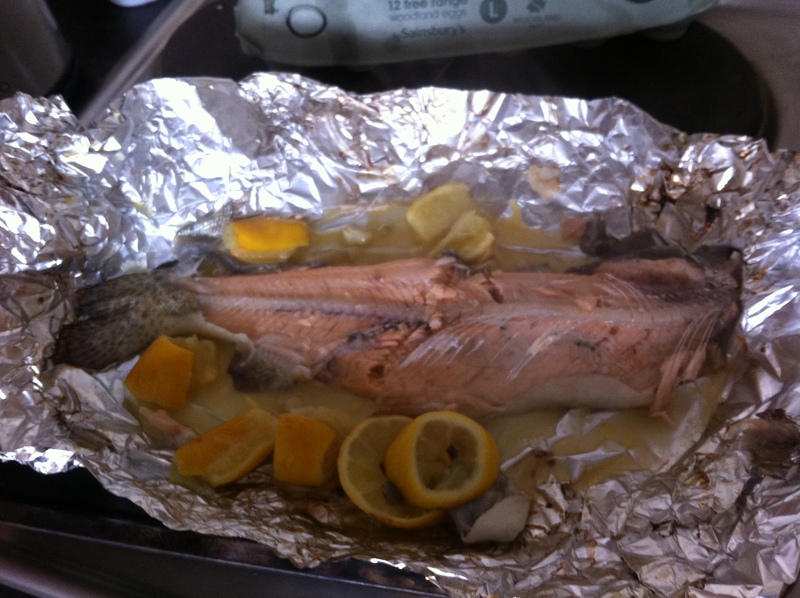 We got the trout home, and the next morning I found a recipe and baked it in the oven, with lemons, garlic and a load of olive oil, all wrapped up in a silver foil parcel. It tasted quite good! And its lucky I thought so, because I then ate 3/4 of the damn thing myself. Dave politely tried it before revealing that he doesn’t like fresh water fish. Caitlin insisted she would not be eating any of it, and no amount of persuasion or threats would budge her. Rosie and Eva agreed to eat a mouthful in exchange for ’10 points’ from their father, which were quickly proven to be of zero material worth. Inexplicably the simple pair went on to eat another 9 mouthfuls each, in order to win ‘100 points’ – equally meaningless. 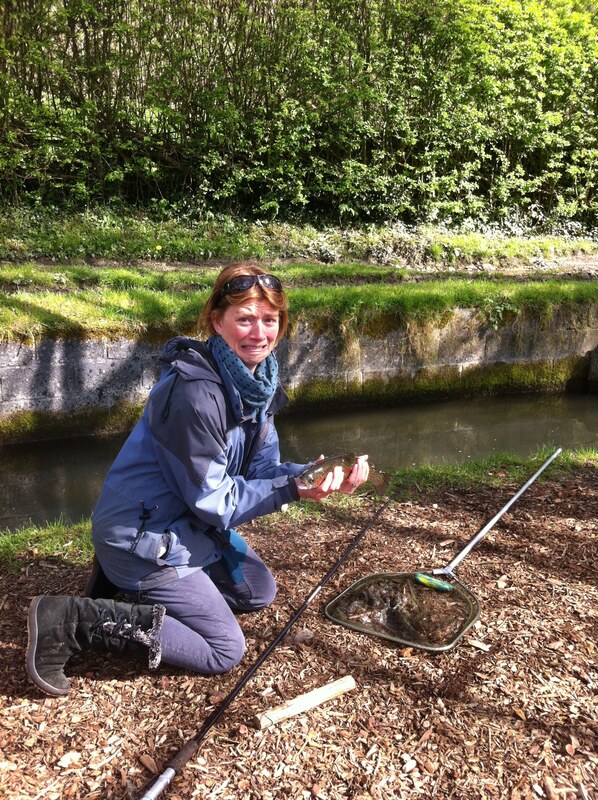 That was as far as they could be persuaded to go, and it still left me with an awful lot of trout to consume. Hi Caroline, I don’t know if you’ll remember me, but I’m Jo Samways (now Dodd) and I was at QE for 6th form. Anyway, Jane (Angel) Roberts shared your link with me and I just wanted to let you know that I think your blog is fantastic!! Very inspirational in that it makes me think about all of the things I want do to/should do, and it’s a VERY amusing read! Best of luck with your remaining challenges – can’t wait to read more about them! I thought this one was going to be renamed “#65 bludgeon a live animal to death in front of your horrified children” ? I initially wrote “#65 batter a fish to…” but then I realised that it was too blatant a pun.